Collins Booksellers - “Double Canister at Ten Yards” by David Shultz, 9781940669496. Buy this book online. Gettysburg is one of the most famous and studied battles of history, and Pickett’s Charge, its climax on the third day, continues to fascinate a new generation of readers. Most accounts of the grand assault focus on General Robert E. Lee’s reasons for making the charge, its preparation, organization, and ultimate failure. 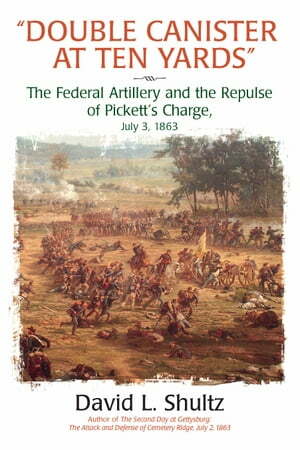 Author David Shultz, however, in “Double Canister at Ten Yards”: The Federal Artillery and the Repulse of Pickett’s Charge, July 3, 1863, focuses his examination on how and why the Union long-arm beat back the Confederate foot soldiers. After two days of heavy fighting on July 1 and 2, 1863, the commander of the Army of the Potomac, Maj. General George G. Meade, correctly surmised General Lee would remain on the offensive on July 3 and strike the Union center on Cemetery Ridge. Meade informed Maj. Gen. Winfield Hancock, whose infantry lined the ridge, that his sector would bear the brunt on the morrow and to prepare accordingly. Meade also warned to his capable chief of artillery, Brig. Gen. Henry J. Hunt, and tasked him with preparing his guns to deal with the approaching assault. Shultz, who has studied Gettysburg for decades and walked every yard of its hallowed ground, uses official reports, letters, diaries, and other accounts to meticulously explain how Hunt and his officers and men worked tirelessly that night and well into July 3 to organize a lethal package of orchestrated destruction to greet Lee’s vaunted infantry in an effort that would be hailed by many historians as “The High Water Mark of the Confederacy.” The war witnessed many large scale assaults and artillery bombardments, but no example of defensive gunnery was more destructive than the ring of direct frontal and full-flank enfilading fire Hunt’s batteries unleashed upon Lee’s assaulting columns. The iron rain broke and drove back the massed attack within a short time, leaving a fraction of the attacking force to cross the Emmitsburg Road to scale the deadly Ridge.